The annual NRA Hunters’ Leadership Forum dinner at the NRA Annual Meetings in Atlanta on Apr. 27 was a hit as the NRA stepped up its investment to save hunting’s future. But the private cigar-smoker event sponsored by LandLeader that followed kept the camaraderie going well into the night. Why? Because enjoying a cigar takes time—and forces one to live in the moment. But this particular smoker was extra special as PAYNE-MASON Cigars was onsite to hand-roll them—the long filler, the binder and the wrapper—an act nothing short of art. As I watched the Cuban master roller at work, an image reflecting the celebrated history of cigars, I appreciated the effort that went into creating that fine cylinder of tobacco as he selected the wrapper, diligently and patiently working to make for a pleasant smoke. As with any activity—hunting, of course, comes to mind—many there clearly knew the game as I listened to them talk with the old timer. The overall common denominator: Everyone here was a hard-working all-American hunter and NRA member who simply appreciated the opportunity to relax over a fine cigar after a good meal with people who shared the same interests. In scanning just a few faces from Donald Trump Jr. to firearm and hunting industry colleagues, multiple conversations were taking place—some likely in support of the new NRA Hunting campaign that was unveiled during the NRA HLF dinner. As I glanced back at the master, I connected the dots. The world of cigars is like the world of firearms considering its popular culture and ever changing industry. While one can stay on top of emerging cigar trends and production techniques, true connoisseurs also know the little things—like humidors and accessories. For the hunters in this room, no doubt accessories were just as important as all those little gear items we hunters stash in our day packs. Any cigar fans set to visit NRA headquarters and the National Firearms Museum in Fairfax, Va., this summer can check out PAYNE-MASON Cigars firsthand at the NRA Store, or visit the store website to select from two 6-inch, medium-bodied varieties available online. First up is the smooth-drawing, mild-bodied NRA Torpedo Golden. Aged five years, its Connecticut Shade wrapper is hand-rolled and features hand-selected Dominican and Honduran fillers aimed to create a classic smoking experience. The NRA Torito Barber almost looks too elegant to smoke … almost. Featuring wrappers that are rolled simultaneously to mimic the candy cane of a barber pole, the two-toned, double-wrapped cigar pairs an aged Connecticut Shade leaf with a mildly spiced Dominican Corojo leaf. PAYNE-MASON says you will taste the aged Ecuadorian Binder and complex combination of fillers that deliver a sweet, delicate and well-balanced smoking experience. Both varieties are encased in glass, feature an NRA logo band and are priced at $15.95. 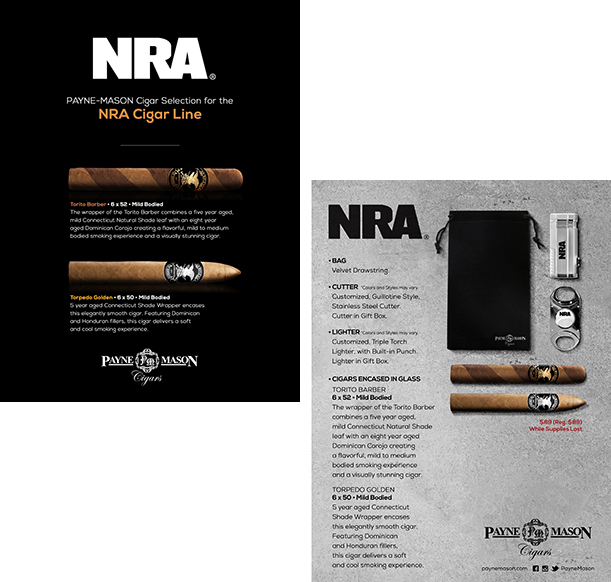 The NRA Store and PAYNE-MASON Cigars have teamed up to offer an exclusive gift set for Second Amendment-supporting cigar aficionados, including an NRA stainless steel cutter and triple-torch lighter with a built-in punch cutter, a Torito Barber cigar, a Torpedo Golden cigar and a velvet gift bag for $68.95. (Accessories also are sold separately.) The high-end cigars are handcrafted by Cuban master cigar rollers and designed to deliver a memorable smoking experience. They feature custom NRA bands and arrive sealed in glass tubes to preserve freshness. The PAYNE-MASON Cigars website also has you covered, offering travel humidors in two sizes for protecting your hand-rolled cigars during travel to an evening affair or on that next hunt, golf outing or other sporting event. Additional NRA items online include a customized gift set featuring a exotic hardwood box with the NRA Logo that contains five cigars and an NRA 12-count-display engraved box with cigars encased in glass for freshness. Order online or call 760-744-9007. For some history, a January 2009 article in Time magazine noted the United States had consumed some 300 million cigars by the mid-19th century, enticing many Cuban cigar-makers to migrate to nearby Florida. The early 20th century had aficionados such as American humorist and author Mark Twain saying, “If I cannot smoke in heaven, then I shall not go." Twain, who has written about hunting with his shotgun as a child and claimed to smoke 20 cigars per day, certainly gives one food for thought as someone whose cigars were as much a part of him as his wit and white suits. Decades later, iconic American novelist, hunter and cigar fan Ernest Hemingway referenced Twain’s works, noting that “all modern American literature comes from Huckleberry Finn” and celebrating that particular book in the same way Twain would have done: by smoking a cigar. And then there was cigar-chomping comedian and actor George Burns, who did his part to promote enjoying a good cigar, claiming to have smoked 10 to15 a day until he died in 1996—at age 100. Whether or not one is a cigar smoker, cigars in the 21st century—like firearms—remain a fixture in American culture. Ample cigar bars, lounges and private clubs now cater to those who enjoy a good cigar, such as the members-only CXIII Rex located in Alexandria, Va., a mere half hour from NRA headquarters.